A Thai court has sentenced a man and a woman to two years and six months in jail each for "damaging the monarchy". Patiwat Saraiyaem, 23, and Pornthip Munkong, 26, had pleaded guilty to breaking strict lese majeste laws which protect the royals from any insults. The charges related to a play they performed at a university in 2013. Thailand's lese majeste laws are the world's strictest, but critics say the military government is increasingly using them to silence dissent. The two were convicted on one count of lese majeste which carries a maximum sentence of 15 years in prison. The sentence was reduced because both admitted guilt, the judge said. 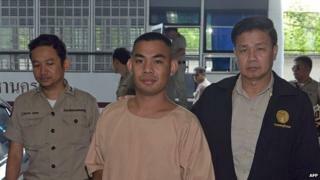 As they awaited their verdict, Pornthip Munkong and Patiwat Saraiyaem smiled and waved at their supporters in Bangkok's main criminal court. Most of the crowd were fellow student activists; among them I recognised some of the few who have dared protest against military rule. Pornthip's mother hugged her tearfully. Pornthip told me she had done nothing wrong in staging the play, but had pleaded guilty to try to reduce the sentence. Some people go to jail for 10 years or more, she said. I don't want to do that at my age. Her's and Patiwat's crime was to test the limits of the lese majeste law. "The Wolf Bride" got little attention when it was staged in 2013. At the time other left-leaning groups tried bolder allegorical songs or performances questioning the official glorification of King Bhumibol. For a while they got away with it. But the regime that took power in last May's coup has stated that no dissent on the monarchy will be tolerated; even past transgressors will be hunted down and punished. The play, called The Wolf Bride, was set in a fantasy kingdom and featured a fictional king and his advisor. It marked the 40th anniversary of a student pro-democracy protest that was crushed by a military regime. However, the full details have not been widely reported because under the laws media coverage which repeats details of the offence is considered the same as the original statement. It was performed at Bangkok's Thammasat University in October 2013 while Patiwat Saraiyaem was a student and Pornthip Munkong had recently graduated. The pair were not arrested until the following August and have been held in custody ever since. Human rights groups say there has been a rise in royal defamation cases since the military seized power in a coup in May last year. Our correspondent says 15 people have been charged with lese majeste since then. More than 90 cases are being investigated and police are aiming to bring charges in about half of them, he adds. Recent convictions include a taxi driver jailed for two-and-a-half years after his passenger recorded their conversation. A student was also sentenced to the same amount of prison time for defaming the monarchy in a Facebook post. The military has more widely suppressed dissent by detaining opponents, banning protests and censoring the media. Thailand's King Bhumibol Adulyadej, 87, is given an almost god-like status by many Thais. He has been on the throne for six decades, making him the world's longest serving monarch.